Our extensive preclinical and pilot clinical work, over several years, has enabled us to model successful pivotal trials of the scanner. Our published research and ongoing clinical trials are part of our company culture and continue to validate our technology and help us understand the significant implications for breast health assessment. The QT Ultrasound team includes medical doctors, engineers, and scientists. This esteemed group of professionals has authored and published many important papers on transmission ultrasound in the field. This study proves that full 3D transmission ultrasound has a remarkable ability in identification of breast anatomical structures. Multimodality comparison also shows that transmission ultrasound tomography can be useful in understanding breast anatomy and physiology. 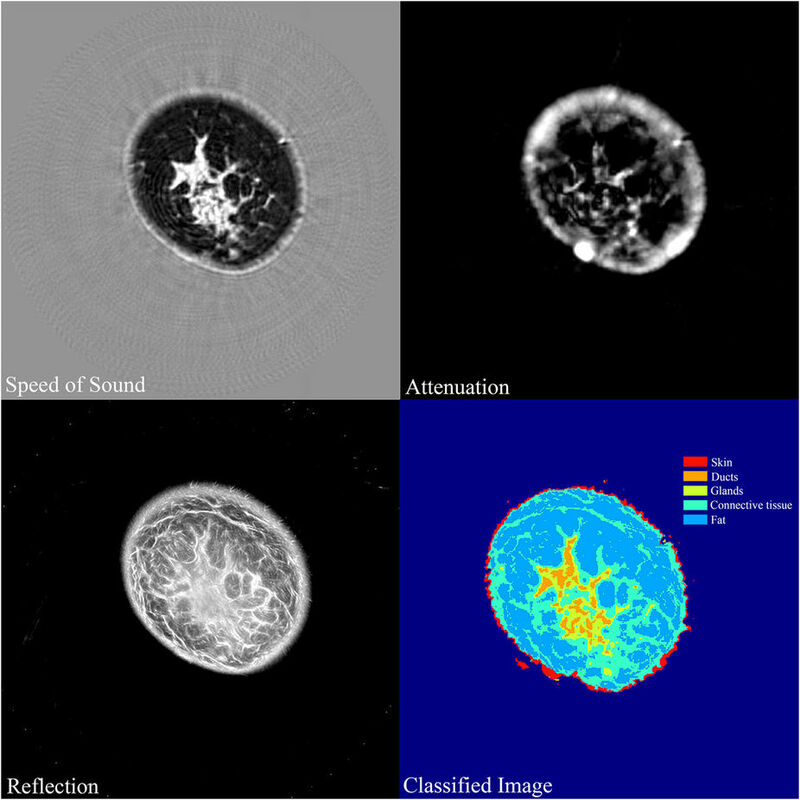 The speed of sound of breast macrocysts, as observed using transmission ultrasound, correlated with the cytological features of intracystic cell clumps. On the basis of this work with speed as a classifier, we propose a spectrum of breast macrocysts from fluid-filled to highly cellular. 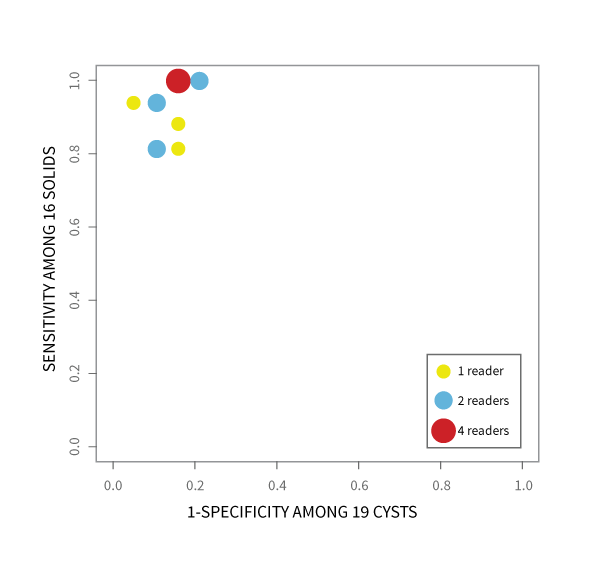 Our results suggest high-speed cysts are mature macrocysts with high cell counts and many cellular clumps that correlate with cyst microanatomy as seen by transmission ultrasound. Quantitative Transmission (QT) ultrasound has shown promise as a breast imaging modality. 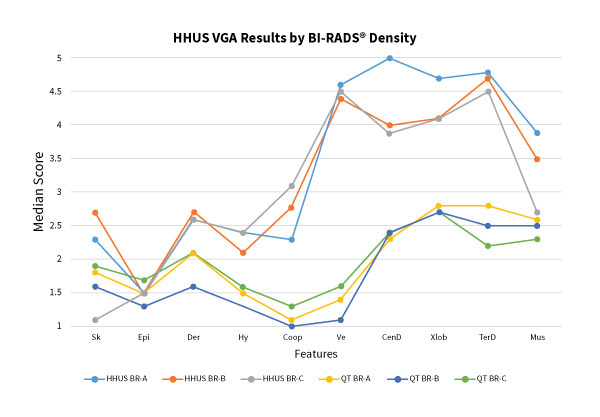 This study characterizes the performance of the latest generation of QT ultrasound scanners: QTScanner 2000. The results show an improvement in the imaging performance of the system in comparison to earlier ultrasound tomography systems, which are applicable to clinical applications of the system, such as breast imaging. We performed visual grading analysis studies comparing transmission ultrasound, digital x-ray mammography and hand-held ultrasound when visualizing ten normal breast anatomic structures. To compare the image quality of the three modalities, multiple readers scored the image quality of transmission ultrasound compared to the other two modalities using an ordinal rating scale. The study showed that transmission ultrasound can adequately see all the major anatomical features of the human breast, including ductal and glandular tissue detail, even in dense breasts. This study shows the ability of QT ultrasound to determine whether a breast lesion is a cyst or a solid. QT ultrasound imaging was performed as adjunct to mammography. A total of fourteen readers evaluated the images. The results show that QT ultrasound provides an accurate assessment of a cyst versus a solid lesion in the breast. In this paper, we describe the technical details of our image reconstruction algorithm. We show that the 3D inversion algorithm provides a more detailed image when compared to 2D algorithms, which results in a clearer depiction of the breast anatomy and lesions. We show that QT ultrasound is essentially a multi-modality imaging system that can differentiate between different breast tissue types such as skin, fat, glands, ducts and connective tissue. This study is a first step towards a computer aided detection/diagnosis platform for QT ultrasound. Breast imaging performed using QT ultrasound can delineate anatomical structures within the breast. For many breast features such as skin, connective tissue, blood vessels and ductal units, QT ultrasound shows significantly better image quality in comparison to mammography. We provide a metrics to characterize transmission ultrasound. We then use this metrics to measure the imaging performance of QT ultrasound. We evaluated a prototype QT scanner for its ability to perform both speed of sound and reflection imaging. 1. J. F. Greenleaf, S. A. Johnson, S. L. Lee, G. T. Hermant, and E. H. Woo, “Algebraic Reconstruction of Spatial Distributions of Acoustic Absorption within Tissue from Their Two-Dimensional Acoustic Projections,” in Acoustical Holography: Volume 5, P. S. Green, Ed., ed Boston, MA: Springer US, 1974, pp. 591-603. 2. Wiskin, J. W., “Modelling of Acetylcholine Release from Neurons and Parameter Estimation”,Lect. in Applied Math, Vol. 19, American Math. Soc. , 1980. 3. S. A. Johnson, F. Stenger, C. Wilcox, J. Ball, and M. J. Berggren, “Wave Equations and Inverse Solutions for Soft Tissue,” in Acoustical Imaging, J. P. Powers, Ed., ed Boston, MA: Springer US, 1982, pp. 409-424. 4. S. A. Johnson and M. L. Tracy, “Inverse Scattering Solutions by a Sinc Basis, Multiple Source, Moment Method — Part I: Theory,” Ultrasonic Imaging, vol. 5, pp. 361-375, 1983. 6. M. L. Tracy and S. A. Johnson, “Inverse scattering solutions by a sinc basis, multiple source, moment method — part II: Numerical evaluations,” Ultrasonic Imaging, vol. 5, pp. 376-392, 1983/10/01/ 1983. 7. S. A. Johnson, Y. Zhou, M. K. Tracy, M. J. Berggren, and F. Stenger, “Inverse scattering solutions by a sinc basis, multiple source, moment method — Part III: Fast algorithms,” Ultrasonic Imaging, vol. 6, pp. 103-116, 1984/01/01/ 1984. 8. Johnson, S.A., D.T. Borup, Wiskin, J. W., R.S. Eidens and M.J. Berggren, , “Imaging Shear and Bulk Elastic parameters in Three-Dimensions by fullwave, Non-Pertubative Inverse Scattering Tomography with Examples from Large Grids, Limited View Angles and Real Data,” Acoustic Imaging 18, 1989. 9. Wiskin, J. W., S.A. Johnson, D.T. Borup and M.J. Berggren, , “Non-pertubative Modeling and Inversion of Elastic and Acoustic inhomogeneous Structures Imbedded within a Layered Half Space,” SEG 1989 Summer Workshop, Snowbird, UT, Aug. 13–17, 1989. 10. Borup D. , S. Johnson, Wiskin, J. W. and M. Berggren, 1989, “Integral equation algorithms for imaging arbitrarily inhomogeneous distributions of elastic parameters imbedded in a homogeneous space,” SEG 1989 Summer Workshop, Snowbird, UT, Aug. 13–17, 1989. 11. Seader, J.D., M. Kuno, W.J. Lin, Johnson, S. A. K. Unsworth and Wiskin, J., W., “Homotopy Continuation methods“, Computers and Chemical Engineering..Vol. 14, No. 1, pp. 71-85, 1990 — Winner Best Paper of 1990 Award. 12. Wiskin, J. W., “Geometric and Integral Equation Methods for Scattering in Layered Media”., Ph.D. Dissert., Dept. Math., University Microfilms International, Ann Arbor, MI., 1991. 14. S. A. Johnson, D. T. Borup, M. J. Berggren, J. W. Wiskin, R. Eidens, “Modeling of Inverse Scattering and Other Tomographic Algorithms in Conjuction with Wide Bandwidth Acoustic Transducer Arrays for Towed or Autonomous Sub-bottom Imaging Systems”, IEEE Oceans 92. Conference, Vol 1, pp. 294-299 (Oct 26-29, 1992). 15. S.A. Johnson, M.J. Berggren, D.T. Borup, J.W. Wiskin, R.S. Eidens, and H. Leng, “Comparison of Inverse Scattering and Other Tomographic Imaging Algorithms Using Simulated and Tank Data for Modeling Subbottom Imaging Systems,” IEEE Oceans ’93 Conference, October 18- 21, 1993 , Vol. I, pp. 458-492 (1993). 16. J.W. Wiskin, S.A. Johnson, D.T. Borup, M. Berggren, R. Eidens, Y. Zhang. “Full Inverse Scattering vs. Born-Like Approximation for Imaging in a Stratified Ocean”, IEEE Oceans ’93 Conference, Vol. III, pp. 450-455 (October 18-21, 1993). 17. Wiskin, J. W., S. A. Johnson, D. Borup, M. Berggren, and R. Eidens, “Full Inverse Scattering vs. Born-like Approximation for Imaging in a Stratified Ocean”, Proc. of Engineering in harmony with the Ocean (Oceans ’93), Victoria, British Columbia, Oct. 1993. 18. Johnson, S. A., D. T. Borup, M. J. Berggren, Wiskin, J. W., R. S. Eidens, 1993, “Comparison of Inverse Scattering and Other Tomographic Imaging Algorithms using simulated and Tank Data for Modeling Sub-bottom Imaging Systems,” Proc. of Engineering in harmony with the Ocean (Oceans ’93), Victoria, British Columbia, Oct. 1993. 21. R.S. Eidens, J.W. Wiskin, D.T. 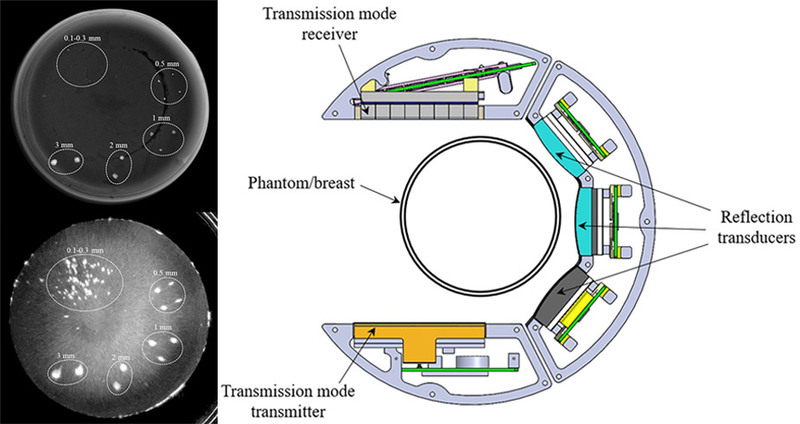 Borup, S.A. Johnson, and M.J. Berggren, “Experimental Verification of Acoustic Inverse Scattering Tomography — Simple Phantoms,” submitted to IEEE UFFC. 22. Wiskin, J.W., D. T. Borup, and S. A. Johnson, “Inverse Scattering from cylinders of arbitrary cross-section in Stratified Environments”, in Progress in Electromagnetics Research Symposium (PIERS), July 24-28, 1995, University of Washington, Seattle, WA, p.195. 23. Borup, D. T., S. A. Johnson, and J. W. Wiskin, FDTD and Integral Equation simulation of a Prototype Ultrasound Breast Scanner, in Progress in Electromagnetics Research Symposium, (PIERS) July 24-28, 1995, University of Washington, Seattle, WA, pp. 621. 25. Yuan, X. , J. W. Wiskin, D. T. Borup, M. Berggren, Rick Eidens, S. A. Johnson, “Formulation and Validation of Berenger’s PML Absorbing Boundary for the FDTD simulation of Acoustic Scattering”, IEEE Trans. UFFC. 44, 4, 1997 (IEEE Trans Ultrason., Ferro, Freq. Control..
26. Yuan, X., D. Borup D. T., Wiskin, J. W., Berggren, M., Johnson, S. A. and R. Eidens, “Simulation of acoustic wave propagation in dispersive media with relaxation losses by using FDTD methods with PML absorbing boundary condition”, accepted for publication, Trans. of Ultrasonics, Ferro., and Freq. Control. 27. J.W. Wiskin, D.T. Borup, and S.A. Johnson. “Inverse Scattering from cylinders of arbitrary cross-section in stratified environments via Green’s operator,” J. Acoust. Soc. Am., 102 (2), Pt.1, August, pp. 853-864, 1997..
28. Steven A. Johnson, David T. Borup, James W. Wiskin, Michael J. Berggren, Michael S. Zhdanov, Kyle Bunch, and Richard Eidens, “Application of Inverse Scattering and Other Refraction Corrected methods to Environmental Imaging with Acoustic or Electromagnetic Energy“, in Next Generation Environmental models and computational methods., Ed. George Delic, Mary F. Wheeler, Proceedings of a U.S. Environmental Protection Agency sponsored workshop at the National Environmental Supercomputing Center, S.I.A.M., 1997. 29. Wiskin, J. W., Borup, D. T., Johnson, S. A., “Inverse Scattering from cylinders of arbitrary cross-section in stratified environments via Green’s operator“, J. Acoust. Soc. America, 102 (2), Pt.1, August, pp. 853-864, 1997. 30. Yuan, X. ,Wiskin, J. W., D. T. Borup, M. Berggren, Rick Eidens, S. A. Johnson, “Formulation and Validation of Berenger’s PML Absorbing Boundary for the FDTD simulation of Acoustic Scattering”, IEEE Trans. UFFC. 44, 4, (IEEE Trans Ultrason., Ferro, Freq. Control. ), 1997. 31. Wiskin, J. W, “Fast and accurate 3D acoustic propagation and inversion in layered media environments”, Canadian Acoustical Association Annual meeting, London, Ontario, Canada, and published in special issue of Canadian Acoustics/Acoustique Canadienne, Vol. 26, no. 3, September 1998, proceedings, cahiers des actes, Oct. 27-30, 1998. 32. J.W. Wiskin, D. Borup, S.A. Johnson. “Fast and Accurate Acoustic Propagation and Inversion in Layered Media Environments,” presented Oct. 27-30, 1998, at the Canadian Acoustic Association (CAA) Conference, in London, Ontario, Canada, Secretary of CAA, Ottawa, Ontario, Canada. 33. Steven A. Johnson, David T. Borup, James W. Wiskin, Michael Zhdanov, Edward Nichols and Ugo Conti, and Giuseppe Guarino. “Construction of CPT Hardware and Software for 3-D, EM Imaging of DNAPL by Quasi-Static Regime Methods,” 2nd Quadrennial Symposium on Three-Dimensional Electromagnetics (Symposium Honoring G Hohmann), Univ. of Utah, Oct. 26-29, 1999. 34. (ABSTRACT FOR INVITED TALK) S.A. Johnson, D.T. Borup, J.W. Wiskin: “Integrating Experimental Procedures with Algorithms for Practical Imaging by Full Wave, Nonlinear Inverse Scattering”. XXVIth General Assemble of International Union of Radio Science (U.S.R.I.). , Assemblee’ Ge’ne’rale de l’Union radio-scientifique internationale . Toronto, Ontario, Canada, August 13-21, 1999. Invited Lecture. 35. Wiskin, JW, Johnson, SA, Borup, DT., “Integrating Experimental Procedures with Algorithms for Practical Imaging by Full Wave, Non-Linear Inverse Scattering,” Invited Lecture (Presenting Author: J. Wiskin), Assemblee’ Generale de l’Union radio-scientifique internationale, XXVIth General Assembly of the International Union of Radio Science (U.R.S.I. ), Aug. 13-21, Toronto, Ontario, Canada, 1999. 36. Yuan, X., D. Borup D. T., Wiskin, J. W., Berggren, M., Johnson, S. A. and R. Eidens, “Simulation of acoustic wave propagation in dispersive media with relaxation losses by using FDTD methods with PML absorbing boundary condition“, I.E.E.E. Trans. of Ultrasonics, Ferro., and Freq. Control., Vol 46, No. 1, January, 1999. 37. Wiskin, J.W., M. Zhdanov, D. T. Borup, S. A. Johnson, J. Riley, O. Portniaguine, “3-D EM Imaging in Quasi-Static regime, of Inhomogeneities in Ocean Sediment with Layered Green’s Functions: Experiment and Theory”, Second International Symposium on Three- Dimensional Electromagnetics, University of Utah, Salt Lake City, U.S.A., October 27-29, 1999. 39. Johnson, S. A., D. T. Borup, J W. Wiskin, M. J. Berggren, T. Guillerm, and S C. Olsen, “Fast, non-perturbative, transmission inverse scattering, quantitative imaging with laboratory and simulated acoustic data”, Invited lecture at 139th Meeting of the Acoustical Society of America, May, 2000. 40. (ABSTRACT FOR INVITED TALK) S.A. Johnson, D.T. Borup, J.W. Wiskin, M.J. Berggren, T. Guillerum,:and S.C. Olsen. “Fast, nonperturbative, transmission inverse scattering, quantitative imaging with laboratory and simualt4dacoutic data”. Acoustical Soc. of Amer., 139th Meeting, 31 May 2000, Weston Peachtree Plaza, Atlanta, GA.
41. Wiskin, J. W,, Johnson, SA, Borup, DT., “Wave Propagation and Nonlinear Inversion in Layered or Moving Media – Fast Algorithms for High Contrasts,” Soc. Indust. Appl. Math. (SIAM) Annual Meeting, Proceedings, San Diego, California, July 9-13, 2001. 42. Johnson, SA, R. Hanover, DT Borup, JW Wiskin, M. Berggren, “Noninvasive Breast Tissue Characterization Using Ultrasound Speed and Attenuation: In Vivo Validation”, Acoustical Imaging 28 Symposium in San Diego, California, March 20-23, 2005. 43. Johnson, S., D. T. Borup, J. W. Wiskin, Included section in Revision of ‘Image Reconstruction from Projections: The Fundamentals of Computerized Tomography’, Gabor T. Herman, Academic Press, New York, 2005. 44. Wiskin, JW, DT Borup, SA Johnson, M Berggren, T. Abbott, R. Hanover, “Full Wave Nonlinear Inverse Scattering: High Resolution Quantitative Breast Tissue Tomography”, Invited Talk at the 28th Acoustical Imaging Symposium in San Diego, California, March 20- 23, 2005. 45. Johnson, SA, R. Hanover, DT Borup, JW Wiskin, M Berggren, M Kammeyer, Scott Olsen, Jeff Pattee, F. Setinsek, K. Stewart, B. Hanover, “Design and first Clinical Implementation of the Ultrasound CT™ System for Breast Imaging”, Acoustical Imaging 28 Symposium in San Diego, California, March 20-23, 2005. 46. Wiskin, JW, Borup, DT, Johnson, SA, Berggren, M., Hanover, B., Setinsek, F., Hanover, R., Acoustic Inverse Scattering in Breast Imaging, 1st Annual Mountain West Biomedical Engineering Conference, Snowbird Cliff Lodge, Snowbird, Utah, Sept. 16-17th, 2005. 47. Steven A. Johnson, Robert Bell, Michael Berggren, David Borup, Barry Hanover, Rita Hanover, Martin Kammeyer, Scott Olsen, Jeffrey Pattee, David Robinson, Frank Setinsek, Kortlan Stewart, and James Wiskin. “DESIGN AND FIRST CLINICAL IMPLEMENTATION OF AN ULTRASOUND-CTTM SYSTEM FOR BREAST IMAGING”. 28th International Acoustical Imaging Symposium, San Diego, CA, USA, March 20-23, 2005. Plenum/Kluwer, Dordrecht, Netherlands. (written but not submitted). 48. Steven A. Johnson, Thomas Abbott, Robert Bell, Michael Berggren, David Borup, David Robinson, James Wiskin, Scott Olsen and Barry Hanover. “NONINVASIVE BREAST TISSUE CHARACTERIZATION USING ULTRASOUND ATTENUATION: IN VIVO VALIDATION”. 28th International Acoustical Imaging Symposium, San Diego, CA, USA, March 20-23, 2005. Plenum/Kluwer, Dordrecht, Netherlands. 49. J Wiskin, D.T. Borup, S.A. Johnson, M. Berggren , T. Abbott, R. Hanover. “FULL WAVE, NON-LINEAR, INVERSE SCATTERING: HIGH RESOLUTION QUANTITATIVE BREAST TISSUE TOMOGRAPHY”. 28th International Acoustical Imaging Symposium, San Diego, CA, USA, March 20-23, 2005. Plenum/Kluwer, Dordrecht, Netherlands. 50. Johnson, S.A., D.T Borup, J.W. Wiskin, M.J. Berggren, B. Hanover, F. Setinsek,, S.C. Olsen, K. Callahan, and staff. “From laboratory to clinical trails; an odyssey of ultrasound inverse scattering imaging for breast cancer diagnosis”, invited, 4th Joint meeting of the Acoustical Society of America and the Acoustical Society of Japan., 28 Nov.–02 Dec. 2006, Sheraton Waikiki Hotel, Honolulu, Hawaii.. Special session on: BIOMEDICAL ULTRASOUND/BIORESPONSE TO VIBRATION: (BB), Acoustic tomography in tissue., Nov. 2006. 51. Wiskin, J., D. Borup, S. Johnson, M. Berggren, B. Hanover, S. Olsen, F. Setinsek, R. Hanover, and TSI staff, Full wave nonlinear inverse scattering for transmission breast imaging, 4th JOINT MEETING OF THE ACOUSTICAL SOCIETY OF AMERICA AND THE ACOUSTICAL SOCIETY OF JAPAN 28, Special session on: BIOMEDICAL ULTRASOUND/BIORESPONSE TO VIBRATION: (BB), Acoustic tomography in tissue., Nov. 2006. 52. Andre, M.P. , C. Barker, N. Sekhon, L.K. Olson, D. Borup and J. Wiskin, Recent experience with ultrasound computed tomography for breast imaging, (invited), 32nd International Symposium on Ultrasonic Imaging and Tissue Characterization, May 16-18, Arlington, VA., 2007. 55. Wiskin, J., D. Borup, S. A. Johnson, M. Berggren, F. Setinsek, B. Hanover, S. Olsen and K. Callahan, Multi-frequency, fully nonlinear, acoustic inverse scattering: theory and breast tissue characterization, 32nd International Symposium on Ultrasonic Imaging and Tissue Characterization, May 16-18, Arlington, VA. 2007. 59. Andre, M.P. , C. Barker, N. Sekhon, L.K. Olson, D. Borup and J. Wiskin, Recent experience with ultrasound computed tomography for breast imaging, (invited), 32nd International Symposium on Ultrasonic Imaging and Tissue Characterization, May 16-18, Arlington, VA., 2007. 61. Wiskin, J., 3-D Imaging Molecular Diagnostics: Inverse Scattering Algorithms, James Wiskin, Ph.D., Invited talk at the AACC sponsored 40th Annual Oak Ridge Conference – Breakthrough Technologies for Clinical Diagnostics , The Fairmont, San José, CA., American Assoc. of Clinical Chemists, San Jose California, April 17 – 18, 2008. 62. M.P. Andre, C Barker, N Sekhon, J Wiskin, D Borup, K. Callahan: Pre-clinical experience with full-wave inverse scattering for breast imaging: Sound speed sensitivity, Acoustical Imaging 29:73-80, Springer, Dordrecht, 2009. 63. Wiskin, J., D. Borup, S. Johnson, “Inverse Scattering, Theory”, Acoustical Imaging, 30, Monterey, Calif., 2009. 64. Wiskin, J., D. Borup, K. Callahan, Y. Parisky, J. Smith, M. Andre, S. Johnson, “Inverse Scattering, Results”, Acoustical Imaging 30, Monterey, Calif., 2009. 66. Wiskin, JW, Borup, D., Johnson, SJ, Berggren, M., Smith, J. Callahan, K., ‘Quantitative Ultrasound Inverse Scattering and Tomographic Refraction Corrected B-Scan, American Institute of Ultrasound in Medicine (AIUM), March 27, 2010. 67. Borup, D., Wiskin, JW, Pelligretti, P., Brusaca, M., Hanover, B., Johnson, Berggren, Klock, J, ‘360 Degree Compounded, Refraction Corrected Reflection Images of Human Breast’, American Institute of Ultrasound in Medicine (AIUM), March 26, 2010. 68. M.P. Andre, C Barker, N Sekhon, J Wiskin, D Borup, K. Callahan: Pre-clinical experience with full-wave inverse scattering for breast imaging: Sound speed sensitivity, Acoustical Imaging 29:73-80, Springer, Dordrecht, 2009. 70. J. Wiskin, D. Borup, K. Callahan, Y. Parisky, J. Smith, M. André, S. Johnson, Inverse scattering Results, Acoustical Imaging 30, pp. 61-68, Springer, Dordrecht, 2011. 71. J. Wiskin, D. Borup, S. Johnson, Inverse scattering: Theory, Acoustical Imaging 30, pp. 53-59, Springer, Dordrecht, 2011. 72. Pellegretti, P, S Dellepiane, M. Vicari, M. Zani, M. Weigel, D. Borup, J. Wiskin, U. Saueressig, E. Kotter, and M. Langer A Clinical Experience of a Prototype Automated Breast Ultrasound System Combining Transmission and Reflection 3D Imaging, UFFC 2011-IEEE International Ultasonics Symposium Oct. 18-21, 2011, Session P3Ab, b Tomography. 76. J. Wiskin, D. Borup, S. Johnson, Inverse scattering: Theory, Acoustical Imaging 30, pp. 53-59, Springer, Dordrecht, 2011. 77. J. Wiskin, D. Borup, K. Callahan, Y. Parisky, J. Smith, M. André, S. Johnson, Inverse scattering Results, Acoustical Imaging 30, pp. 61-68, Springer, Dordrecht, 2011. 79. Andre, M, J. Wiskin et al., AIUM Annual Convention, New York, 2011, “Quantitative 3- Dimensional Whole-Breast Imaging With Transmission and Reflection Ultrasound”, Advanced Breast Imaging Symposium, Moderators: M. Andre and P. Carson, Ph.D.
80. J. Wiskin, D. Borup, K. Callahan, Y. Parisky, J. Smith, M. André, S. Johnson, Inverse scattering Results, Acoustical Imaging 30, pp. 61-68, Springer, Dordrecht, 2011. 81. J. Wiskin, D. Borup, S. Johnson, Inverse scattering: Theory, Acoustical Imaging 30, pp. 53-59, Springer, Dordrecht, 2011. 83. M André, J Wiskin, D. Borup, S. Johnson, H Ojeda-Fournier and L Olson, Quantitative Volumetric Breast Imaging with 3D Inverse Scatter Computed Tomography, Proceedings, Eng. Med. Biol. Soc. Conf., EMBC 12, San Diego, California, Aug. 28 – Sept. 1, 2012, peer reviewed Invited paper. 84. M André, J Wiskin, D. Borup, S. Johnson, H Ojeda-Fournier and L Olson, Quantitative Volumetric Breast Imaging with 3D Inverse Scatter Computed Tomography, Proceedings, Eng. Med. Biol. Soc. Conf., EMBC 12, San Diego, California, Aug. 28 – Sept. 1, 2012, peer reviewed Invited paper. 85. M André, J Wiskin, D. Borup, S. Johnson, H Ojeda-Fournier and L Olson, Quantitative Volumetric Breast Imaging with 3D Inverse Scatter Computed Tomography, Proceedings, Eng. Med. Biol. Soc. Conf., EMBC 12, San Diego, California, Aug. 28 – Sept. 1, 2012, peer reviewed Invited paper. 91. Malik, B. et al. Objective breast tissue image classification using Quantitative Transmission ultrasound tomography. Nature Sci. Rep. 6, 38857; doi: 10.1038/srep38857 (2016). 92. Elaine Iuanow, MD, Kathleen Smith, MBA, Nancy A. Obuchowski PhD†, Jennifer Bullen MS† and John C. Klock, MD. Accuracy of Cyst vs. Solid Diagnosis in the Breast Using Quantitative Transmission (QT) Ultrasound. Academic Radiology 2017 Vol 24:1148-1153; doi: 10.1016/j.acra.2017.03.024. Epub 2017 May 23; PubMed ID 28549870. Academic Radiology has posted the study in full for free. http://www.healthimaging.com/topics/womens-health/breast-imaging/and-coming-ultrasound-technology-shows-prowess-mammography-adjunct. 95. 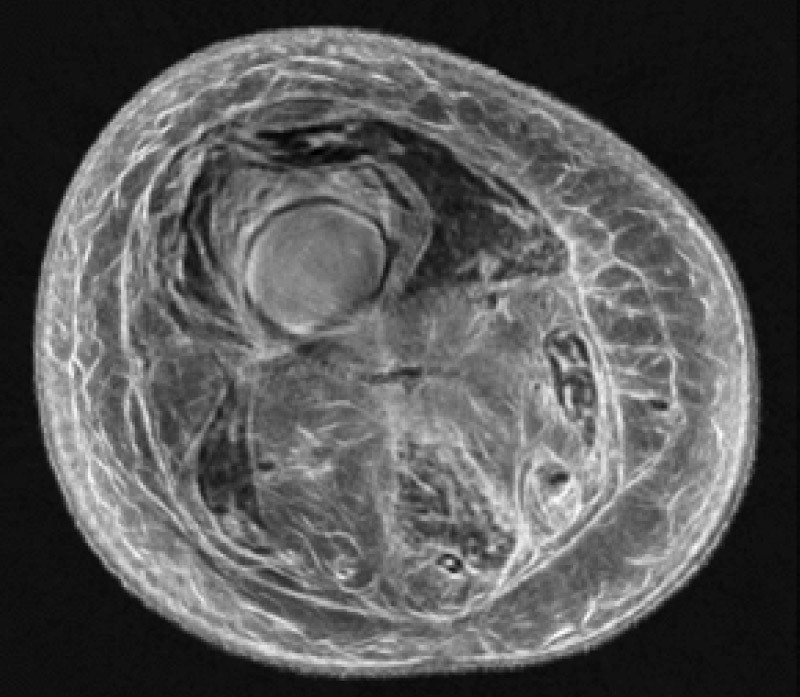 Bilal Malik, Austin Todd, Alyson Terry, Farzad Fereidouni, Rajni Natesan, John Klock, James Wiskin, Mark Lenox, Richard Levenson; Radiologic-pathologic Validation of Transmission Ultrasound Tomography Using Microscopy with UV Surface Excitation Study available here. 96. James Wiskin, Bilal Malik, Rajni Natesan, Nasser Pirshafiey, John Klock, Mark Lenox; Transmission Ultrasound Imaging of the Human Knee Study available for download here. Thoughtful and robust clinical trials result in exceptional clinical care, and that’s the mission of the Marin Breast Health Trial Center. Our team there is studying the efficacy of the QTscan through ongoing clinical trials. The scans are delivered in an environment designed around the comfort and peace of mind of the women who participate. The QTscan has been cleared by the FDA for use in breast imaging as an adjunct to mammography. At this time, it is not intended as a replacement for screening mammography. Study Goal: A prospective multi-center case collection study of breast imaging examinations from women with mammographically-detected lesion(s) to evaluate the non-inferiority of digital mammography and transmission ultrasound together compared to digital mammography and hand held ultrasound together in the evaluation of lesion(s) detected with diagnostic mammography. Results published in Academic Radiology. Study Goal: The purpose of this retrospective study is to evaluate and compare the diagnostic accuracy of QT breast imaging vs. hand held ultrasound as an adjunct to digital mammography to aid in distinguishing a cyst versus a solid lesion in the breast using historical QT images. Enrollment Status: This study is enrolling participants by invitation only. Study Goal: To evaluate the detection and characterization of breast findings of QT Ultrasound and comparing to hand held ultrasound and/or digital mammography (with and without tomosynthesis) and to fulfill NIH Grant RO1CA138536 from the National Cancer Institute. Study Goal: A prospective multi-center case collection study of breast imaging examinations from women to evaluate the non-inferiority of QT Ultrasound compared to digital mammography-with tomosynthesis. Study Goal: A prospective multi-center case collection study of breast imaging examinations from women with non-suspicious breast masses to correlate the calculated mass doubling time using Quantitative Transmission Ultrasound (QT Ultrasound) with mass histology.